Mens suits that are modern fit are suits that are more tailored than regular fit suits. 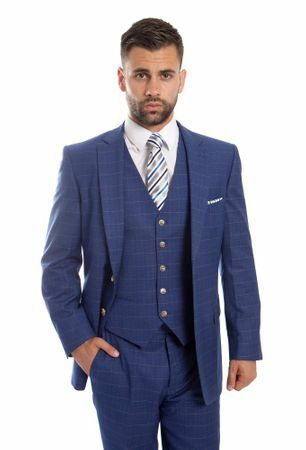 This rich looking blue 3 piece suit is made of a fine wool fabric with a square design pattern on it. Since this 3 piece style suit is modern fit, it will fit like it was custom tailored for you. The pants are flat front no pleat style and the jacket has side vents in the back.